We gather at 9:30 for “CircleTime” to share announcements and greet visitors. We enter the sanctuary at 10:00. Hallmarks of our worship include silence, community prayer, scripture reading, a different preacher each week (open to anyone who feels called), and time for comment and shared reflection. We celebrate Communion on the first Sunday of every month. Worship is usually finished by 11:15, and we gather for coffee and conversation. All children participate in the early part of worship, then leave for separate classes. Since there are no paid clergy at Seekers, Celebration Circle mission group energizes and structures the worship services. CC believes that worship is the heart of the community experience and is the common testimony to the faith journey of the community. They dream of worship which raises up those issues of concern to us as God’s servant people. They dream of inclusive worship in which God speaks through the liturgy, preaching, as well as special services. Read about Seekers worship style by clicking here (PDF format). Enjoy some of the worship resources we provide here. Seekers recognizes that any member of the community may be called upon by God to give us the Word. We have an open pulpit that is scheduled a month ahead by Celebration Circle. The text of our sermons are collected here for further reflection. Feel free to copy from these sermons. We only ask that when substantial portions are abstracted or used in a written work, Seekers Church and the author be credited, and that the URL be cited. See our recent sermons by clicking the “Sermons” heading. Our Inclusive language liturgies set the structure and seasonal theme of Sunday morning worship. All liturgies are written by the mission group Celebration Circle. Feel free to copy from these liturgies. We only ask that when substantial portions are abstracted or used in a written work, Seekers Church be credited, and that the URL be cited. 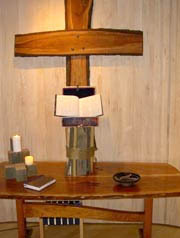 See recent liturgies by clicking “Liturgy” heading. The Revised Common Lectionary is a list of Bible readings used by many churches and denominations around the world. Click here for a complete listing of these readings. See the readings we will be using in worship for this season by clicking the “Bible Readings” heading. Click here for prayers and reflections from one of Seekers’ founders, Sonya Dyer.